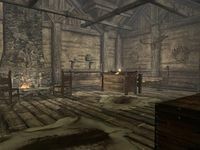 Bolli's House is a small, two-story residence with a cellar, near the city gates in Riften. It is owned by Bolli, who lives there with his wife Nivenor. 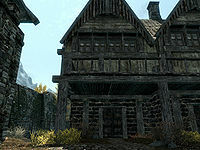 It is the first house on the left when entering Riften from the north. It consists of only one zone, which is the interior. Upon entering there is a cooking pot on a stand to your left against the north wall, with a small square wooden table and two chairs to the right along the same wall. On the table are two salmon steaks, a baked potato, a portion of grilled leeks, a bottle of wine, a loaf of bread, and an eidar cheese wedge. In the northeast corner, under the stairs that lead to the top floor, is a food barrel. There are stairs up and down to the basement, both against the east wall. Against the south wall is a long end table holding a bunch of lavender. The stairs leading up take you straight into Bolli and Nivenor's bedroom, which consists of a double bed coming out from the middle of the west wall, with a dresser at the foot of the bed that holds a bunch of lavender and a note that discusses Bolli's suspicions regarding his wife cheating. To the left of the bed, against the south wall, is a wall shelf holding a wooden bowl containing three purple mountain flowers. Under this is a basket containing three pieces of firewood, which is next to a fireplace. On the mantel are copies of Olaf and the Dragon and Kolb & the Dragon. There are two chairs pulled up in front of the fireplace. Opposite, against the north wall, is an unlocked wooden chest containing gold, with a tall wardrobe to the left along the same wall. Descending the stairs to the basement brings you to a storage area with a set of shelves against the north wall. They hold a gourd, a cabbage, a bunch of elves ear, several pieces of cheese, four potatoes, two bottles of Nord mead, and a bottle of alto wine. A round wooden table is to the left with a pheasant underneath it, and hanging from a rack above are two rabbits and two salmon. There is a doorway in the middle of the west wall, with a cupboard of clutter and a large vat to the left of it and a pile of firewood under the stairs opposite. Through the doorway there are several bales of straw against the south wall and several food barrels against the north wall. Hanging from the doorway are three more salmon. The front door has an adept lock, the key to which is carried by Bolli and Nivenor. There is a "Loot" shadowmark to the left of the entrance door. All containers in the house, with the exception of most barrels and sacks, are non-respawning and safe to store items in. This page was last modified on 29 September 2016, at 10:47.